Jeff Steiner has been fishing for the past 25 years in Hawaiian waters. His boat is 34 ft. long , powered by twin Cummins Diesels with electronics including a CB radio, VHF radio, cellular phone, depth recorder, and G.P.S. The boat is licensed for 6 passengers, but there is no minimum number needed in order to go out. 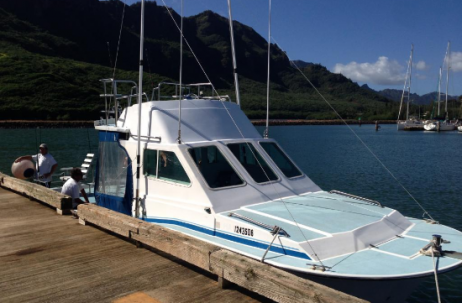 Fishing Charters depart from Kauai’s Nawiliwili Harbor. Morning Charters usually meet around 6:45AM at Nawiliwili Small Boat Ramp. Afternoon times vary. The captain divides the fish according to the wants and needs of the parties who are fishing. Share charter=Share catch. Various fishing techniques are used at different times, depending on the day: trolling, jigging or baiting. Whatever it takes to get hooked up! The boat provides all fishing gear and some beverages. Passengers should bring a snack, wear shoes, comfortable clothing and sunscreen. When booking your fishing charter on Kauai I recommend to make it early on in your vacation so you have plenty time to eat your catch! We have a special rate for spectators if someone in your party wants to come along on the ride. Being out on the ocean is always an awesome day! Call for discounts on Exclusive Charters. 6:45am & 12:45pm depending on availability & time of year. Such a fun and exciting trip!!! My boyfriend and I had an amazing time with Jeff and his crew. Everyone one board got to catch a few fish, the fish were biting everywhere and it was such a thrill to catch the big ones! This was my first time fishing in the ocean and I can’t wait to do it again! We all got to keep as much fish as we wanted and it was all delicious! Mahalo!!! Aloha Chandra! I am happy to hear you had such a great time & caught so many fish! Keep us in mind for your next adventure on Kauai, we look forward to assisting you with your future activities! My wife and I are traveling to Kauai the first week of September for our honeymoon and were looking to do some fishing. Could you provide som pricing on a shared trip for that time of the year? I have been offshore fishing for many years but this would be a first for my wife to be. I hope you can help us celebrate our honeymoon with some big game fish! Aloha Dominic! Congratulations! Yes we have a half day shared trip for $130 per person. Let me know if you have any other questions or would like to make a reservation! Thanks guys, this was one of the the highlights of our Kauai vacation. The tuna you gave us to take home was the best I have ever tasted. Aloha David! So glad you had a great fishing experience! The Breakaway Fishing guys are awesome! I will be sure to pass this on to them, come back for some more fishing soon! I had a question about the fishing tour. We will be staying at the Aston Aloha Hotel Jan 3-10th. It would be a dream to go out fishing and then be able to cook our catch. It doesnt sound like we’d be able to do this since the Aston doesn’t offer a kitchen in our room. Do you know of a place that does offer something of the sort? Aloha! We’ve had a lot of customers grill their catch back at the hotel on the communal grills. They are normally located ocean side of the property or near the pool area. If the Aston does not have communal grills, all of the beach parks do! Pack up and have a BBQ on the beach! I would recommend booking your fishing trip early on in your vacation so you have more days to eat your catch! I’ve been fishing on the Great Lakes my whole life and never caught Tuna…did’t know what to expect. We went on to a FISHING BATTLESHIP! Captain Jeff and his 1st mate Brian were a machine of efficiency and hospitality. Our boat caught 20 Yellow Fin Tuna with 5 monsters, probably over 500 lbs of fish. I caught 4 myself. We’ll have plenty of great fish to eat for the rest of our vacation! With great whale watching…the whale watching was worth the money! Aloha Jim! That is what I like to hear! Captain Jeff has been fishing Hawaiian waters for over 20 years, can’t beat his expertise. So happy to hear you had an awesome time with a huge catch of Tuna! Hope to have you all back again sometime soon!